Oh, look - another LG Nexus leak! I'm already convinced that this is the worst kept secret in Nexus history. 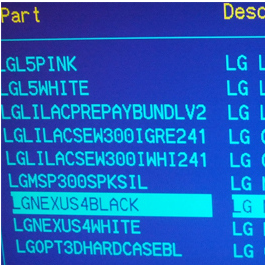 Alas, the shiny little beast has made its way into Carphone Warehouse's inventory system as the "LGNexus4," and it looks like we'll be seeing two color variations of the device: white and black. While we've heard the device could be called the "LG Optimus G Nexus" (effectively making it the worst Nexus name in the history of everything), rumors are still flying around every day. One thing's for sure, though: it's highly unlikely that it will be called the "Nexus 4;" after all, Carphone Warehouse does call the Nexus S the "nexus 2." Stay tuned - I'm sure this isn't the last piece of leaked info we'll see in the growing LG Nexus saga.